Screening “Four Billion Reasons” as part of the accessibility strand An Unashamed Claim To Beauty organized and presented by Theresa Heath of Wotever DIY Film Fest. Pink Life QueerFest organized by Pink Life Lesbian, Gay, Bisexual and Trans (LGBT) Solidarity Association in Ankara, is the first queer festival in Turkey. 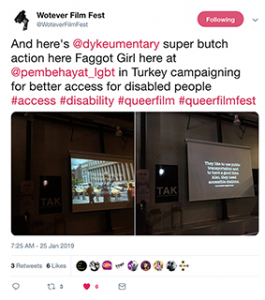 Film enthusiasts have an opportunity to watch LGBT-themed films from different countries from all around the world. First edition of the festival was held in 2011 in Ankara. Starting from the 4th edition the festival takes place both in Ankara and Istanbul and from the 5th edition, it travels to Denizli, Mersin, Çanakkale and İzmir. The 8th edition will be organized between 10-27 January in Ankara and Istanbul. This entry was posted in Random Stuff on January 31, 2019 by krissy.